I LOVE my mandolin and also love that it is in my favorite color. 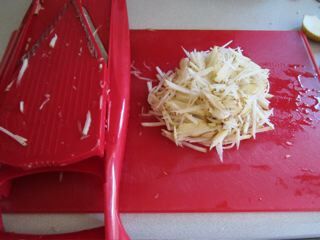 I wanted to experiment with another way to make hash brown potatoes without having to grate them. This worked pretty well and was fast! The down side was that the potatoes ended up with a delicate texture that made them a little mushy in some places. Overall it was a quick fix and produced the desired effect – yummy salty hash browns! Craving: indulged. P.S. put your grated (or mandolin’d) potatoes in water to prevent browning and to draw out some of the starch. Less starch = crispy potatoes. Next Next post: First time making french toast – success!